Swarovski crystal goes green!! Swarovski has always provided us with the finest quality lead crystal that is precision cut and has unparalleled brilliance. Recently, there has been an increased regulatory focus on potential human exposure to lead from various consumer products, including jewelry. “Crystal has unique properties. The crystal manufacturing process creates a matrix which inhibits the mobility of lead. In other words, lead is bound into the structure of the crystal. Because of this structure, lead crystal poses no significant risk of excessive lead exposure to human health via surface contact – hand to mouth, mouthing, or even ingestion. Indeed, Swarovski crystals have been tested under a variety of test methods for extractable lead. 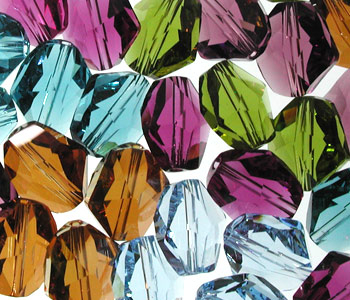 Test conditions and procedures do vary, but lead levels are well below regulatory limits even when the crystal is tested in an acid solution to maximize the release of lead” (Source: www.i-kandi.com/Swarovski). Now, with their unrivaled research and development, Swarovski has expanded their product line to offer a lead-free, sustainable crystal. This new innovative crystal is called Advanced Crystal. Swarovski has done extensive research for the past ten years to bring this high degree of technology to us. A patent has been granted in the United States and 16 European countries for Swarovski’s new crystal formula. 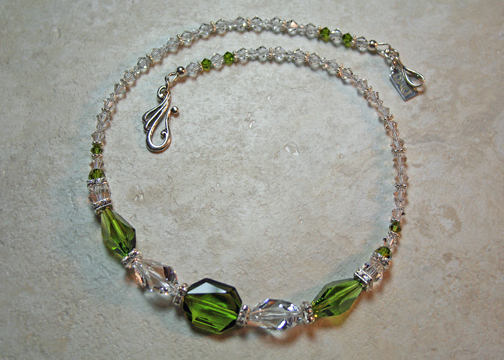 One of my favorite things to do is create one-of-a-kind Swarovski jewelry pieces. Because Swarovski takes its responsibility to its customers and consumers so seriously, I am proud to utilize their products. For more information on the history of Swarovski, click here. This entry was posted in Beaded, Jewelry Designs, Jewelry Tips, Jewelry Tools, Shopping Tips and tagged jewelry, jewelry and fashion, jewelry designs, lead-free crystal, Swarovski, Swarovski Advanced by Denise Ward. Bookmark the permalink.